Note: You can use report template designer to make modifications to report print format of quotation, invoice, sales order, proforma invoice, payment receipt, delivery challan etc. Go to tools menu and click report template designer command. 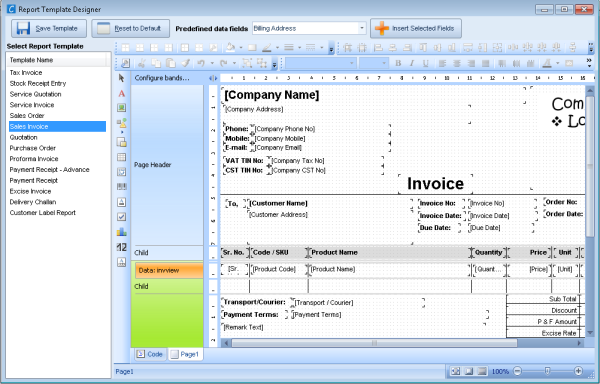 On the report template designer window, select the template that you would like to modify from the drop down list. How to add contents on the report? : The toolbox present on the template designer to the left side allows you to select text, picture and shape objects and drop it on the report format. Once you drop the object on the report format, you can double-click on it to add text if it is text object. You can right-click on the object to see a context menu and get more formatting options. Adding predefined data fields: You can add data columns defined by software system from the drop down list. Most of the data columns are already present on the report. If you have removed any predefined column from the report then you can use predefined list to add it again. After making all the modifications as per your requirement, click on the Save Template button. Hint: In case you make any mistakes while designing the report, you can press reset to default button to bring the report template to its original design.